How do you feel about habits? Do you automatically think about good habits (exercising, tidying, knocking back a green smoothie at the crack of dawn) or bad habits (smoking, drinking, letting your accounts pile up until the end of the year)? I wanted to create a course that made building those little good habits easier, the tweaks that can lead to big, exciting changes in your business and life. Which is where Four Weeks Of Freelance Habits comes in. 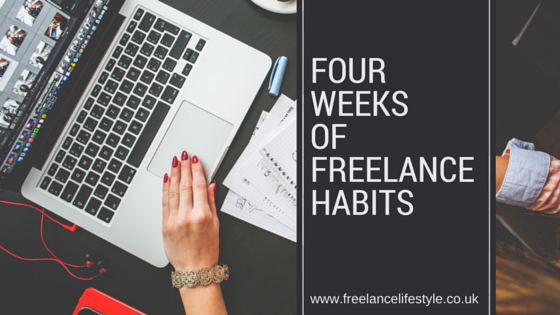 Each week, we'll tackle a new area of your freelance life - health, business, money and balance. With each of these areas, you'll get a choice of positive habits to adopt to make your freelance lifestyle even better. By the end of the month, you'll be well on your way to a rockin' business and life, with just a few tweaks. Dependent on your habit type, you may want to use the comments section at the bottom to be accountable, tweet about it using the hashtag #freelancehabits, set yourself a goal or simply choose the one you want to do the most. The best bit is, you can take this course over and over again to try new habits!